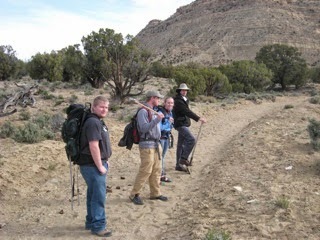 For my blog post I have chosen to write about the stratigraphy of the dig sites where we spent the majority of our time. The two main quarries that we worked in over our two days in the Grand Staircase Escalante National Monument were both located in the Wahweap Formation. The Wahweap Formation is approximately 80 million years old. The climate and geological processes that created it were perfect conditions for dinosaurs to live in and be buried. The Wahweap is composed of mainly two types of rocks: sandstone and mudstone. The plant and animal fossils found in these layers, such as petrified wood, Hadrosaur and Ceratopsian bones, indicate that there was a climate that could support both plant and animal life when it was being deposited. These sandstones and mudstones were deposited in swampy lowlands, shallow lakes, slow moving rivers and floodplains (http://www.gsenmschool.org/Geology/Unit_02/). Most of the running water flowing through the area, at the time, was runoff from the Sevier Mountains to the west, flowing toward the Cretaceous Interior Seaway to the east. As we look at the different sedimentary structures in the Wahweap, we can see more evidence of its environments of deposition such as fine grained sediment sizes and small scale cross beds which indicate slow moving streams and floodplains. The loose mudstone slopes of the Wahweap also indicate that there were lakes and swamps present. This lush and humid climate was perfect for dinosaurs. Erosion of the growing Sevier Mountains created a large source of sediment. 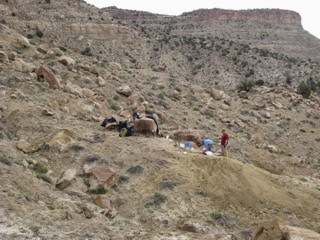 The mountain building to the west created a trough in front of it called a foreland basin which allowed the large source of sediment to build up quickly creating perfect conditions for the burying and preserving of the plant and dinosaur fossils found there today.